From time to time the Club is asked to assist in the placement of older Gordons. These may have been surrendered by the previous owners for a number of different reasons or may have been found and not claimed by the owner. If you are interested in giving an older Gordon a home then this may be for you. To register your interest in offering a home to a rescue please contact the co-ordinator by email gscsecretary@hotmail.com or phone (02)9449 6245. When a Gordon is in need of rescue we list it in the Rescue section of the Dogzonline Website. Hi . . . my name is Dominic. What a big week I have had, last Saturday I was living in the lovely harbour city of Sydney and looking for a new home, by Monday, I was winging my way across the country to live in the beautiful foothills of sensational down-town Adelaide. 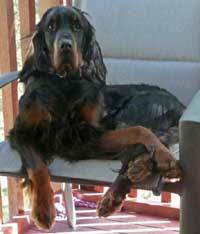 I found my new home through the NSW Gordon Setter Rescue Dogs website. And as you can see from my picture with Sarah, I am happily ensconced in my new situation with my new found lady friend and the two boys. Sarah is a breath of fresh air but she's just kid really and she keeps me on the move but it's a happy kind of tired. I have to say I was a little apprehensive as this big bird came down out of the sky in the gathering twilight to find I was virtually on the edge of a desert and the temperature was dropping fast but by the time I found my way to the terminal, I was wagging my tail and ready for a big adventure. After a fairly long drive home, I met the salacious Sarah in the dark, but out there, by the light of the headlamps, it was love at first sight. She showed me round her big backyard and we played non-stop for nearly an hour before it was time for tea and bed. The new boss thought I might prefer sleeping on my own but I wasn't going to wear that and after nearly an hour, I convinced her that she had got it wrong and that at least Sarah should be allowed to come in and share my bed. We slept very well and very quietly and woke up refreshed with a whole new day to spend exploring my new surroundings. I found the garden is full of birds including two aviaries (I keep a special eye on the budgies) and heaps of other interesting things but my favourite is the big mint flavoured fabric bone. Sarah thinks it's fun to try and get it off me and sometimes I let her. She thinks she is strong but I know better, I'm really just a softy at heart and I love sharing (maybe one day she will learn to share her mum's bed). However, I discovered that the two boys I had been told about are actually cats … but really they are a different kettle of fish. Yoyo is the boss … man has he got a vicious right hook … full of claws and like his name his moods are up and down. I keep out of his way. But Sao he is gentle and remarkably tolerant … he lets me nuzzle him and he pats me on the nose … now that's different, I have never been patted by a cat before but as I said he is gentle and a bit of a comfort when I need quiet moment. I love my new home and I would really like to thank Rescue Dogs for helping me find it. Aria is a dog I placed with a chap in a northern NSW coastal area, and without any consultation with me he handed her in at the local pound, and from there to the RSPCA shelter. He had not had her very long. Luckily her microchip details had not been transferred by the owner and they contacted me for verification of ownership. 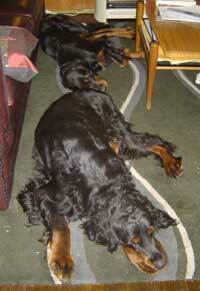 The NSW Gordon Setter Club had Tim & family on their books as wanting another Gordon. So from there they went to meet Aria, who was quite thin., She went to live with them and was renamed Lara. Like a normal Gordon Lara has made herself well and truly at home. This is a photo that Tim sent to me - Lara lying in the hammock - I think a real classic!!!! 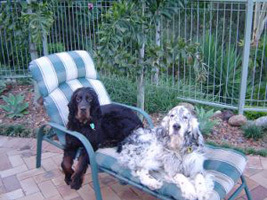 In October 2005 our English Setter "Lady" died suddenly due to a heart attack. This left us with our other English Setter, Rufus. We thought we might be able to get Rufus through this sad time, however after 2 weeks of listening to him crying and howling, we realised that he needed a friend. We started making enquiries about setter puppies. One Friday night whilst doing an internet search we came across this wonderful rescue site. We thought we would find out if there were any dogs that needed a home. We rang Christine that night who informed us of a Gordon that had been surrendered to the Gold Coast pound called Goofy. We brought Goofy home that day and it really is a case of rescuing two dogs. Rufus has a new lease on life and has never played so much and been so active (some days he just finds it hard to keep up). Goofy's days are now spent playing with Rufus, running around our acreage and when it all gets a bit much he goes for a swim in the pool, followed be a lie down on the sun lounge. Life is so hard! He has put on weight and looks much better; his coat is starting to re-grow as well. A family in Sydney was put in touch with Bailey's owners in November 2000 by the Club. Their living circumstances changed and Bailey needed a bit more room to grow up in. Bailey now lives in the north of Sydney with a 10 year old boy, a large garden and as you can see from the photo above, some very affectionate owners! Update 2002: Bailey has totally taken over the house and although he is very obedient, he pretty much rules the house. Latest trick is to wait till someone leaves their bed, and to sneak up and lie upside down with his feet in the air and his head on the pillow . . . . Bailey has also perfected the art of selective deafness!! !